Stephanie works with couples and families struggling with intimacy, communication, conflict, and connecting. Stephanie believes that the most beautiful aspects of life involve healthy and loving relationships and these relationships look different to each and every individual. Stephanie loves helping her clients build meaningful connections, not only with their partners or family members, but with themselves as well. Stephanie believes everyone has a unique perspective that deserves to be heard and understood, and enjoys authentically connecting with each of her clients. 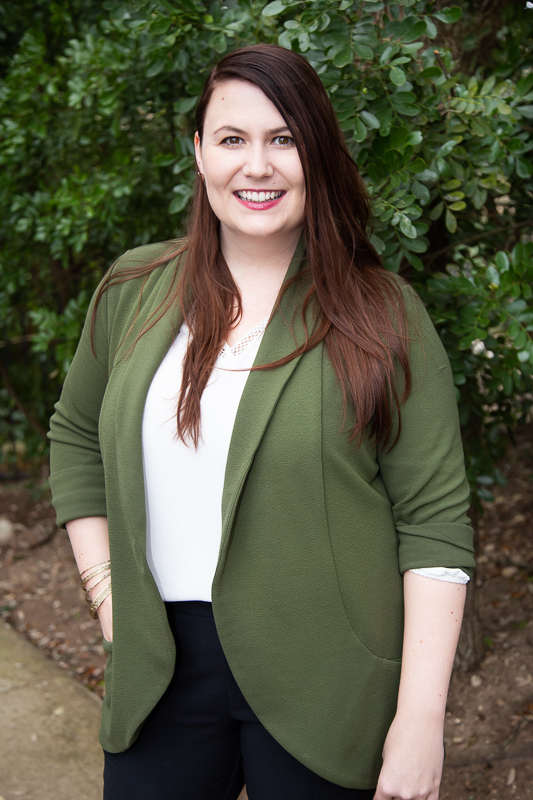 Stephanie loves helping couples and families talk to each other during session, and will work collaboratively with her clients to come up with achievable goals so that any progress made in therapy can translate to their day-to-day lives. Stephanie has Level 1 Gottman training. Stephanie received her Masters in the Art of Counseling degree at St. Edward’s university with a concentration in Marriage and Family Therapy, and earned a bachelor's degree in Communication from DePaul University in Chicago, IL. After attending pastry school and working as a baker for three years, Stephanie realized that though she enjoyed putting love and care into desserts, her true calling was listening to, and helping others. SCHEDULE AN APPOINTMENT WITH Stephanie TODAY.